Oakley — Happy Hearts Working, Inc.
Our Happy Hearts Working Therapy dog, another associate in training! Meet Oakley: Our yellow Labrador retriever! Oakley was born in January 2017 and has been such a joy to our family, since bringing her home during spring break in March as a young, spirited puppy! We have been mindful to acclimate Oakley into our family’s activities, and also provide training for Oakley to perform specific tasks. Oakley is our HHW therapy dog and is an integral part of our organization; Oakley brings happiness and calm to our environment, which is essential for our HHW associates. She is a friend to our HHW associates and others who support our mission. 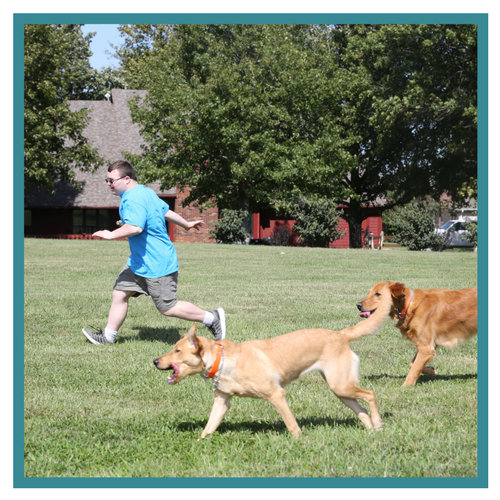 Oakley loves to play in her three acre yard, which is a safe environment for all! Oakley welcomes all as they enter Happy Hearts Working Headquarters. This starts each associate’s day with a feeling of joy and that they are loved. It also offers an opportunity during the day for associates to care for someone else rather than someone caring for them. An increased sense of purpose through responsibility. A dependable and predictable love, affection and nonjudgmental companion.